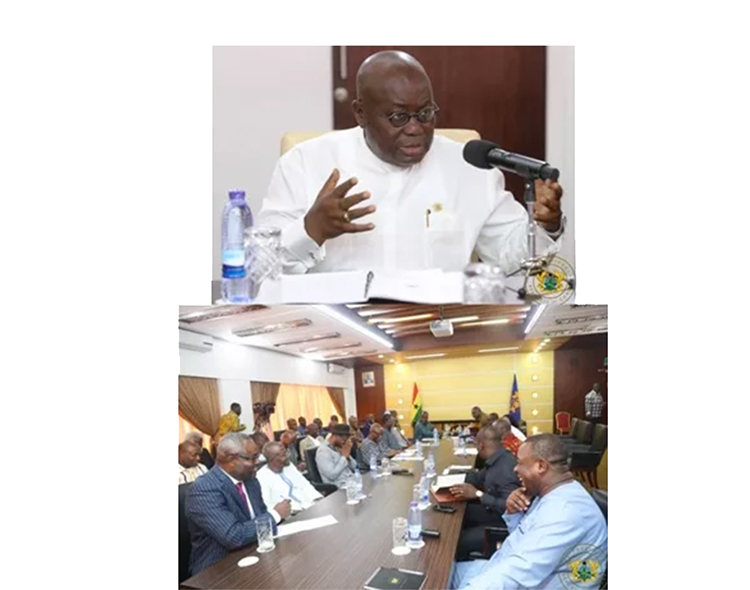 President meets leaders of Political Parties – NPP USA Inc.
President Nana Addo Dankwa Akufo-Addo on Thursday met the leaders of the various political parties in the country at the Flagstaff House in Accra. The meeting, the first between a sitting President and leaders of political parties in recent years, was to enable the President to seek their views on some governance-enhancing measures his administration intends taking. The Chairpersons and General Secretaries of the New Patriotic Party (NPP), the National Democratic Congress (NDC), Progressive Peoples’ Party (PPP), Convention Peoples Party (CPP), Peoples National Convention (PNC), and the National Democratic Party (NDP) represented their parties. Leaders from the Liberal Party of Ghana (LPG), United Peoples Party (UPP), All Peoples Congress (APC), Great Consolidated Popular Party (GCPP), United Front Party (UFP), and the Democratic Peoples’ Party (DPP), were all represented. Lasting over three hours, and held in an atmosphere of frank exchanges and mutual respect, the meeting discussed issues bothering on the commemoration of the Silver Jubilee of the Fourth Republic, on Sunday, January 7, 2018; the election of Metropolitan, Municipal and District Chief Executives; and the creation of new regions, amongst others. President Akufo-Addo intends to hold more of such meetings with the leaders of the political parties in future. The leaders of the political parties also commended the President for the initiative, which they described as laudable.